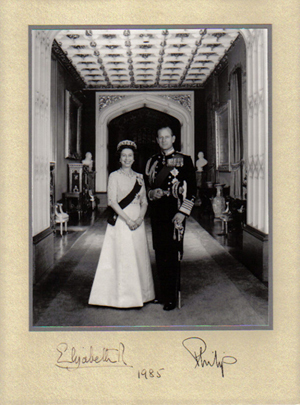 I have amassed a large collection of royal correspondence, photographs,Christmas cards and gifts from the British royal family during the last twenty years. 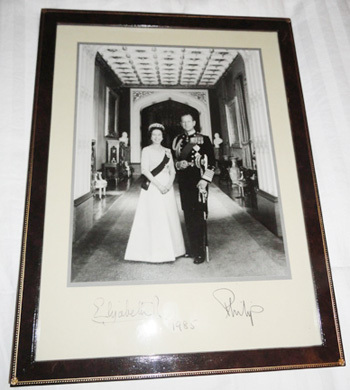 The largest part of the collection is from HRH Prince Charles and HRH Diana, Princess of Wales. 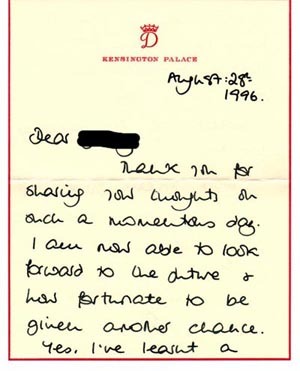 Through their letters, cards and photographs, we follow their lives from the day of their engagement & wedding in 1981 until their 1992 divorce and finally to Diana's untimely death in 1997. 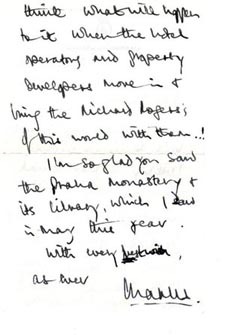 These letters also give an insight to the man "who will be King". All history is recorded by writings, photographs and letters as far back as the pyramids in Egypt. We learn how a people came to be, how they lived and sadly, how they perished. The letters below are a rare and valuable part of history. I have purposely deleted all salutations and greetings on letters and gifts to protect one's privacy. 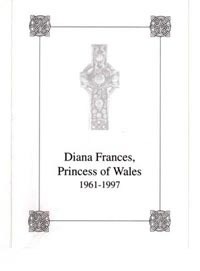 It is astonishing Diana, Princess of Wales, more than five years after her death is still the most famous and most written about royal. 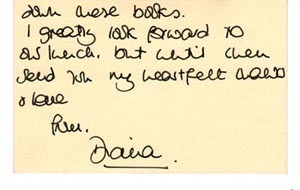 There are more books written on Diana than any other royal in history. Her drawing power seems to grow with each passing year! 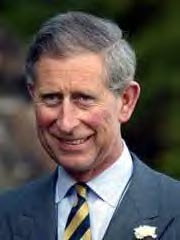 Press coverage of Diana surpasses that of Her Majesty and Prince Charles. 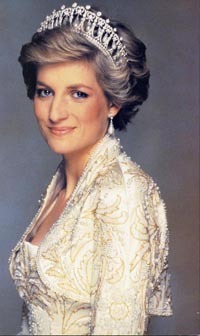 It's been 19 years since the death of Princess Diana, she is still one of the most admired people of all time. A week does not pass without Diana's name being mentioned in the media. There are more books on the late Princess than all the Kennedy's combined. Diana was the most photographed person in recorded history. 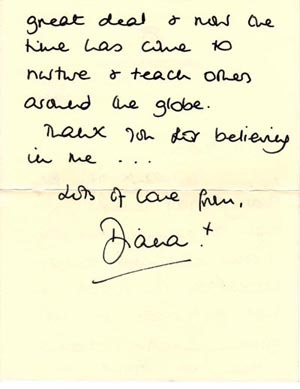 Diana left her mark on the world. 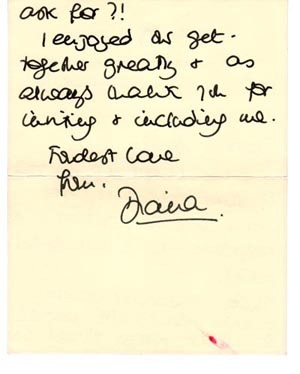 Diana's devotion to her charities are legendary. She set a standard that's hard to equal. Diana ignored the prevailing prejudices and fears about AIDS to clasp the hands of sufferers, and embraced leprosy patients in Indonesia. Diana led the charge for emotion and the unembarrassed displays that now routinely go with it: from hugs and kisses to public tears. These are pretty hefty achievements for a woman who mocked herself for being "thick as a plank." Diana remains an inescapable presence. 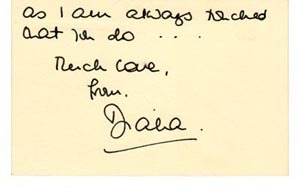 Diana wasn't seen as posh. She was one of the people. She enriched many lives. Many lessons are to be leaned from Princess Diana. 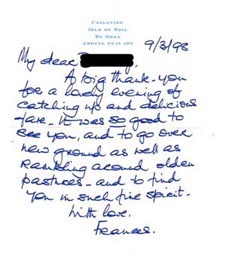 After acquiring letters and cards written by Diana, I remembered the importance of sending a thank you note making everyone in my life feel a little special. 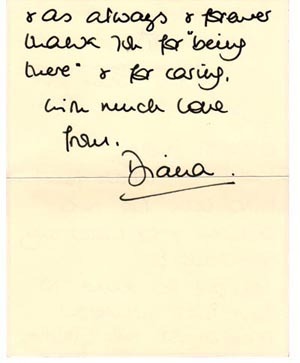 That was one of Diana's greatest gifts. She made everyone who came into her life feel they mattered. 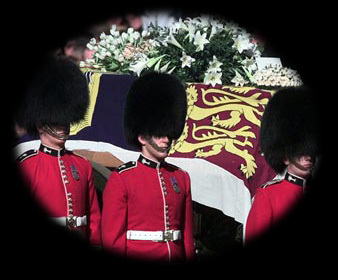 An era ended with the death of Diana and one, I am afraid , we will never see again! 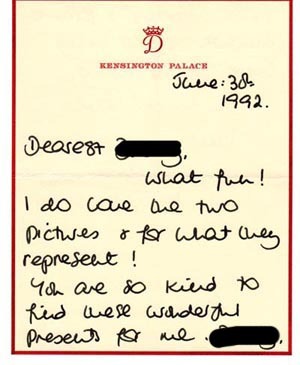 GENUINE, AUTHENTIC signed photos, letters and cards from Princess Diana are becoming extremely RARE. 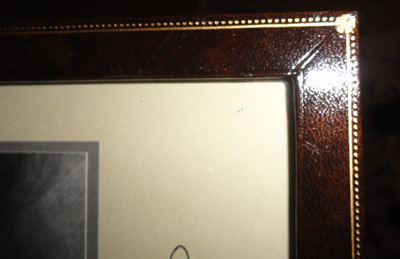 Here is a chance to own a true piece of history. 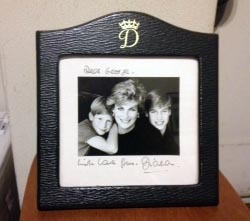 There is no dispute when it comes to Diana being a great mother to sons William and Harry. 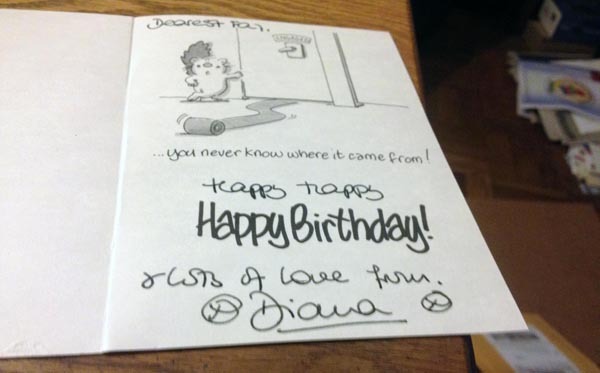 This wonderful signed birthday card was given by Diana to her dresser Fay Appleby. Sadly, Fay died of breast cancer in 2002. I love Diana's slightly risque cards. Fay's son's (see link below) sent everything to auction. 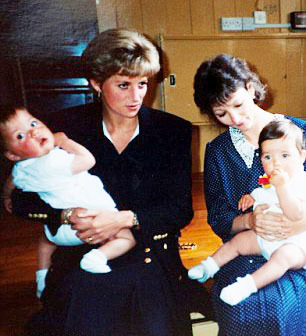 Diana with Fay and her twin sons. 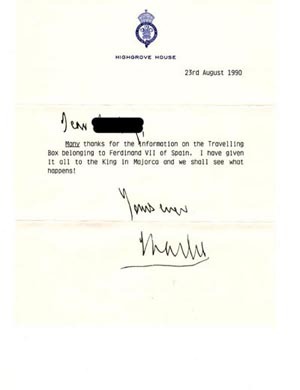 Prince Charles (typed) hand signed letter. 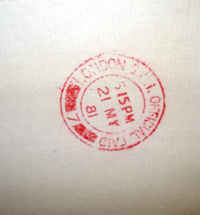 Highgrove House stationary. Comes with original envelope. Many thanks for the information on the Traveling Box to Fernand VII of Spain. I have given it all to the King of Majorca and we shall see what happens! property developers move in & bring the Richard Rogers of the world with them! I'm so glad you saw the Prague Monastery & it's library, which I did in May this year. Sandringham Norfolk stationary. Comes with original envelope. 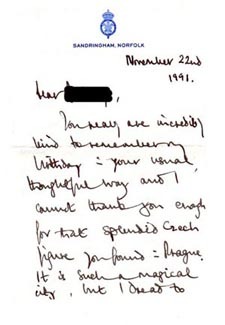 Letter from Frances Shand Kydd on her personal stationary. A big thank you for a lovely evening of catching up and delicious fare. 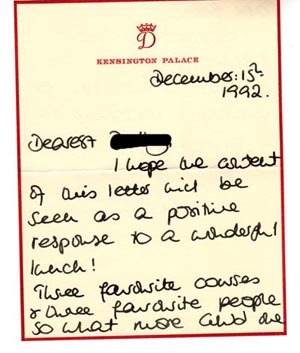 I hope the contents of this letter will be seen as a positive response to a wonderful lunch! Three favorite courses & three favorite people so what ore could we ask for? 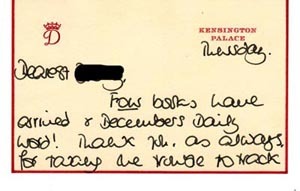 Written on Diana's personal "D" Kensington Palace stationary, includes original envelope. What fun! I do love the two pictures * for what they represent! as always & forever thank you for being there & for caring. 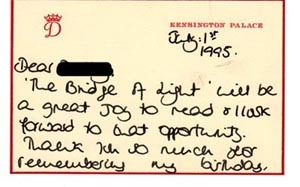 The Bridge of Light will be a great joy to read & I look forward to that opportunity. I am always touched that you do. Four baskets have arrived & December Daily Word! Thank you as always for taking the trouble to track down these books. 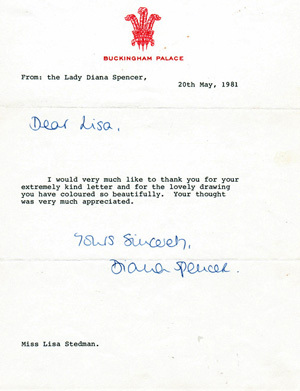 Written on Diana's person "D" Kensington Palace stationary, includes original envelope. Thank you for sharing your thoughts on such a momentous day . I am now able to look forward to the future & how fortunate to be given another chance. & teach others around the globe. 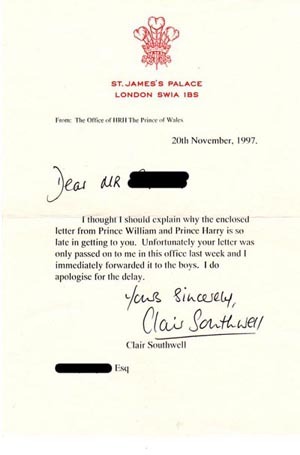 Written the day Diana's divorce from Prince Charles became final. 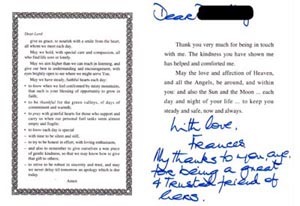 Typed letter with greeting written by Prince William. 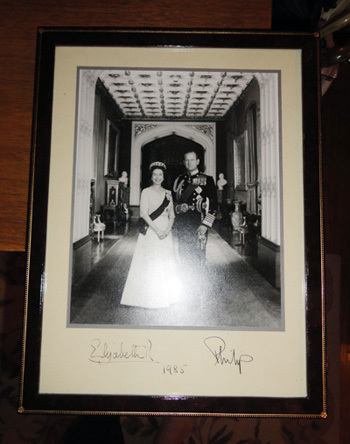 Signed by both Princes William and Prince Harry. 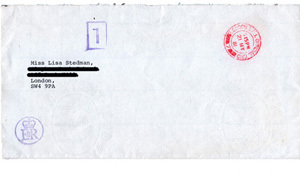 Item 2991- Written on St. James Palace stationary, includes original envelope. we were touched by your consideration. 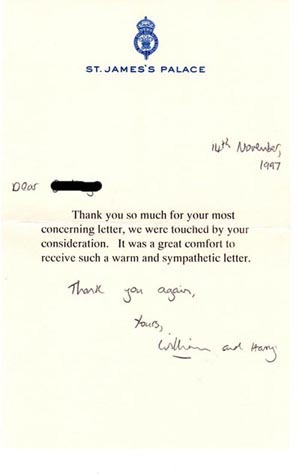 It was a great comfort to receive such a warm and sympathetic letter. 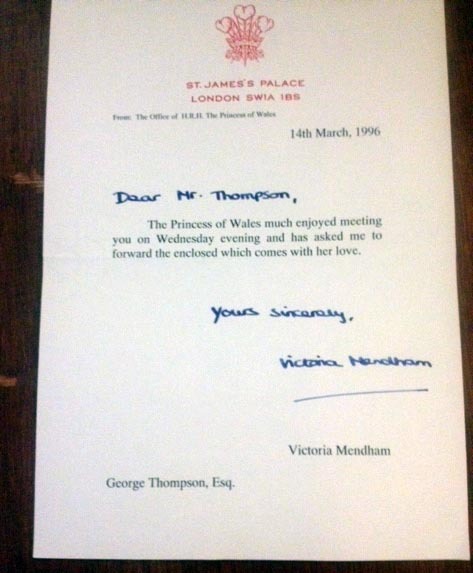 Accompanying letter from St James Palace form the office of HRH The Prince of Wales. and Prince Harry is so late in getting to you. and I immediately forwarded it to the boys. drawing you have colored so beautifully. You thought was very much appreciated. In original box from Smythson of bond Street. Box shows wear. 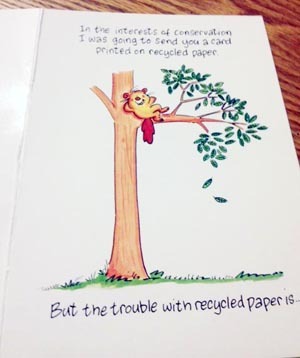 It is 31 years old. Presented at a private audience with Her Majesty to a member of the Queen's Flight Association. 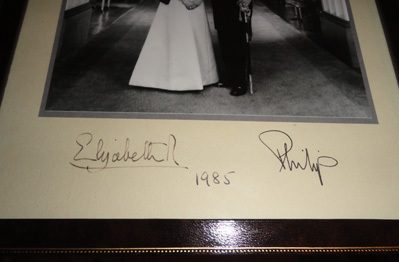 Signed Elizabeth and Philip.